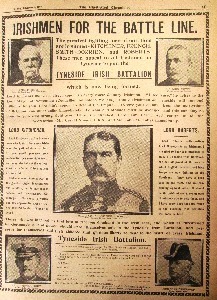 She says: “My information came firstly from family because of a great uncle and his pals who were in the Tyneside Irish. I came across an old photo of a young soldier in my grandparents wardrobe, I asked who was this person then the whole storey began. There was also a huge penny which stood on the hearth which had his name on. From then began an obsession. I have dragged my husband to France and around cemeteries in Durham and Northumberland many many times following the history of Tyneside Irish 24th Battalion. Pallan, C.; L.Cpl. ; 24/1649C; took part in June 1916 raids. Quinn, Wm. ; Pte. ; 24/1261A; Sheriff Hill; Trans. to Labour Corps. Robinson, B.; Cpl. ; 24/1644A; Trans. to West Yorkshire Reg. Russell, T.H. ; Pte. ; 24/491B; Dunston; Trans. to Labour Corps. Sheriden, T.; Pte. ; 24/1021D; Shieldfield; Trans.to Labour Coy. Shields, E.; Pte. ; 24/43B; Dunston; wounded October 1916; Trans.to Labour Coy. Smith, Frank; Pte. ; 24/1450B; Blaydon; died February 1916; buried Ration Farm Cem. Stanley, Richard; Pte. ; 24/1502A; Scotswood; died 1st July 1916; buried Ovillers. Wilson, W.; Pte. ; 24/503C; Dunston; discharged 1917; wounds. Young, Geo. Pte. ; 24/748B; Annfield Plain; wounded December 1916; Transfer to Royal Defence Corps.